A Long gold trail following a series of river valleys. The Wangapeka is a classic route between the historic goldfields around Tapawera and the West Coast. Following the Wangapeka River back to its source, the track crosses two saddles before descending through rich West Coast forest alongside the tumbling Little Wanganui River. Views are limited as most of the track is through forest with only a small section of open tops travel near the end. Little Wanganui Gorge Shelter • By iangeorge. Licence: C.
Crossing the park from east to west, the Wangapeka ends near the Heaphy Track. The two tracks can be walked in succession, forming a rough circuit which will reduce transport costs considerably. The town of Karamea is located between the Heaphy and Wangapeka road ends, and is well set up for trampers, with good accommodation, a DOC office, transport services, and a well-stocked store. 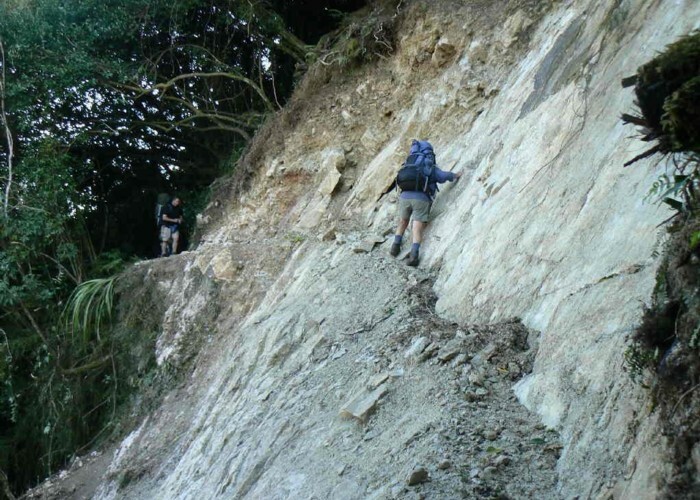 The track is also combined with the Leslie-Karamea Track, which runs from Salisbury Lodge on the tablelands south to its terminus half-way along the Wangapeka Track. There are ample side tracks and tops routes in the area making for a variety of more challenging options. The eastern end of the track is at Rolling Junction Shelter along the gravel Wangapeka River Road, west of Tapawera. The road includes a major ford at the Dart River which becomes impassable in heavy rain. A number of trampers' transport services link the eastern track end with Nelson and Tapawera. The western track end is along the Wangapeka Road near Little Wanganui on the West Coast. Both roads are suitable for private vehicles. Telephones at both track ends are available free of charge to arrange transport. An intentions book is located at an information shelter a kilometre along the road before the track's beginning. Siberia Flat Camping Area is located a minute or two further along the road, and Rolling Junction is just a bit further. Siberia Flat campsite • Basic Campsite (DOC). 40 spaces. Rolling Junction is on the road through to Courthouse Flat where tracks onto Mount Owen begin. The Wangapeka Track however leads off over a clearing, dropping to the Rolling River and crossing on a swing bridge. The easy track follows alongside the Wangapeka River over grassy glades and through beech forest thick with moss and the summer tang of fermenting honeydew. Great place for a snack • By Mike B.
Gibbs Routh leads up onto the Arthur Range, and you will pass a sign for it after a half hour. A bridge over Wright Creek, then Patriarch Creek becomes visible through the trees soon after. As the river becomes louder and faster the track enters forest, becoming a benched trail. It is over 3 hours, past Stoney Creek to Kiwi Stream, indicated on the opposite bank but hidden by the trees. Kiwi Shelter was located here, and a small clearing marks the spot. A swing bridge crosses the Wangapeka immediately and meets a junction with tracks upriver and down river along the true left bank. Turn left (upstream), and it's 30 minutes through pleasant bush to the utilitarian Kings Creek Hut. 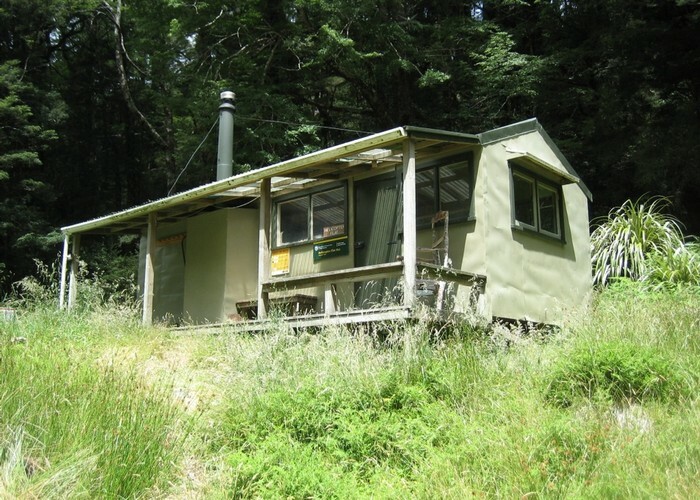 Kings Creek Hut • Serviced Hut (DOC). Capacity: 20. The track resumes on the hillside directly behind the hut and passes the original hut constructed by Cecil King after a few minutes. This rustic hut is located in a handsome glade. Constructed during the depression when the government was subsidising gold mining, the slab hut was occupied by King until 1981. It was later restored by DOC. Cecil Kings Hut • Basic Hut/Bivvy (DOC). Capacity: 4. A sign indicates the South Branch of the Wangapeka River to the left just beyond the hut but there is nothing to see. 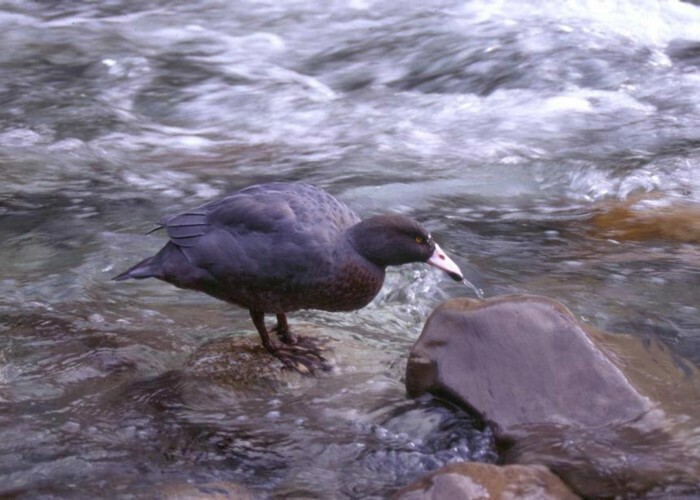 Blue ducks are common in these river valleys and you may see them and hear their discordant whistles over the river noise here or in the rivers further west. Small white flowers of iris, lawyer, Adenochilus gracilis and mikoikoi lie alongside the track in summer. A smooth and mossy track above the roaring river, it climbs very gently, making good time and crossing Luna Stream Bridge just before another bridge crosses the Wangapeka River. Stone Hut is another half hour away, along the true right bank of the Wangapeka. Pleasantly located on a flat by the babbling river, Stone Hut is new and pretty, although small. There is ample camping in the area. Stone Creek joins the Wangapeka immediately outside the hut and a track follows it, providing a route onto Mount Luna. Stone Hut (Kahurangi) • Standard Hut (DOC). Capacity: 10. Blue duck / whio • By Matthew. Continuing behind the hut, the track commences a brief rocky climb through forest, opening onto a flat boulder field after a few minutes. This is the remains of a massive slip set off by the 1929 Murchison earthquake. This earthquake destroyed much of the track and caused major slips throughout the area. The river flows underground through this slip, and the tree trunks still stand where they died surrounded in scree. Although there is no track, the ground is level and the walking is easy along the cleared valley floor. A little stream appears and soon grows in size as you follow back along its course. Keep to the right (true left) as the stream quickly becomes a river. Beside where a creek enters from the right a track takes up in the forest and climbs above the renewed Wangapeka River, just 15 minutes from the hut. The track hops the stones back across the river after a few minutes and climbs quickly alongside before zigzagging away on its own. The track flattens off to a benched sidle as it approaches the Wangapeka Saddle. Forest covered at 1009m, the saddle provides tops access to the left and the right. A smooth sidle through silver beech descends very gradually from the saddle, detouring awkwardly around a slip and coming into the open by Chime Creek. The track fords this shallow creek, with a 3-wire bridge nearby. The young, ankle-deep Karamea River is crossed at an open flat 45 minutes from the saddle. Beyond here the track is a little rough, obviously washed on occasion by the river whose banks it follows closely. 40 minutes later the track drops briefly onto grassy river flats, then around some massive crumbling outcrops of pink granite. The salmon pink colour is the mineral orthoclase feldspar, and the rock is Karamea granite. Beyond here numerous small cataracts drop from the hillside, flowing directly over the non-porous granite bedrock. 2 hours 15 minutes from the saddle, the track crosses the now knee-deep Karamea River. A high water track begins here, remaining on the true left bank. The second crossing is another 15 minutes onward, returning to the true left bank where the high water track ends. It's almost half an hour to the ford or 3-wire bridge of Waters Creek just before Helicopter Flat Hut. 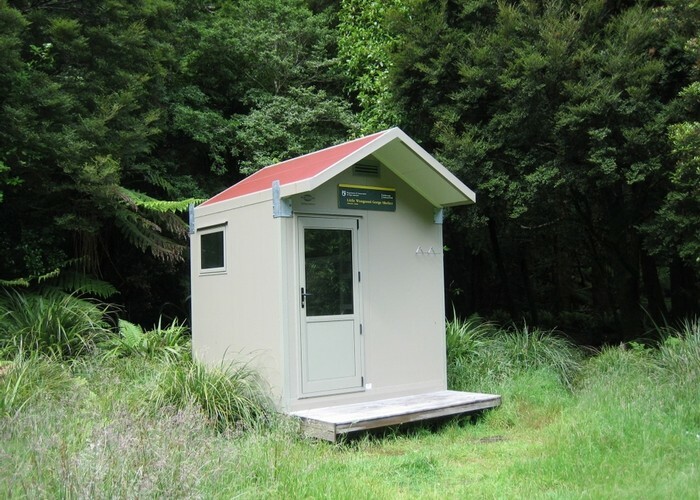 Helicopter Flat Hut • Serviced Hut (DOC). Capacity: 12. The Lost Valley Track over to Trevor Carter Hut on the Leslie-Karamea Track fords just before the hut. Helicopter Flat hut • By iangeorge. Licence: C.
A narrow bench winds along in forest above the river, crossing small side streams and in places cut directly into the granite bedrock. It is 1 hour to the Tabernacle Lookout, a view to savour. This was the site of surveyor Jonathan Brough's hut built in 1898 and known as Brough's Tabernacle. The sunny spot near the junction of the Karamea and Taipo Rivers provides views of the Karamea River and the wrecked landscape of the Luna Slips. A moment later the Saxon Falls Track plunges off downhill to the right and follows a spur to the meeting of the rivers. Beyond the side track the rocky trail of the Wangapeka saunters downhill to a bridge at a deep bend in the Taipo River. A track leads back downstream to the right 40 minutes to Trevor Carter Hut. The Wangapeka Track turns left and follows the Taipo upstream, crawling easily past very deep emerald pools and entering the gently sloping forest of the valley floor. Crossing several channels of Herbert Creek, the forest becomes bright and the trail becomes sloppy. Several creeks cut paths over the bedrock, and handwires are provided. Breaking out briefly onto an old regenerating slip, the stark granite mass of Mount Dean is visible to the left. The slip has blocked the river in the distance, creating a shallow pond of dead, standing trees. Turning alongside the Taipo River, the track ambles up to Taipo Hut. The hut stands in a sunny glade away from the river. To the west the view extends to the basin occupied by Stag Flat high above the forest, where clouds roll through from the West Coast. There is ample camping space here. 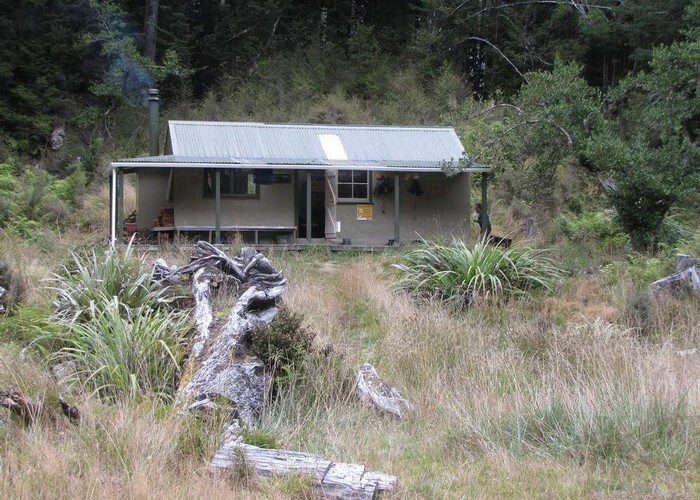 Taipo Hut, Kahurangi • Standard Hut (DOC). Capacity: 16. An easy track from the hut follows the river, crossing the Pannikin Creek swingbridge and beginning to climb. After a half hour the track get steeper, soon meeting the tumbling river. But the track breaks onto the golden, boardwalked, red tussock basin before ever becoming particularly steep. A sign indicates the boggy trail across to the new hut. Stag Flat Shelter The modern conveniences of Taipo Hut really have nothing on this sub-alpine haven. Stay here if you can, and if the weather is good. 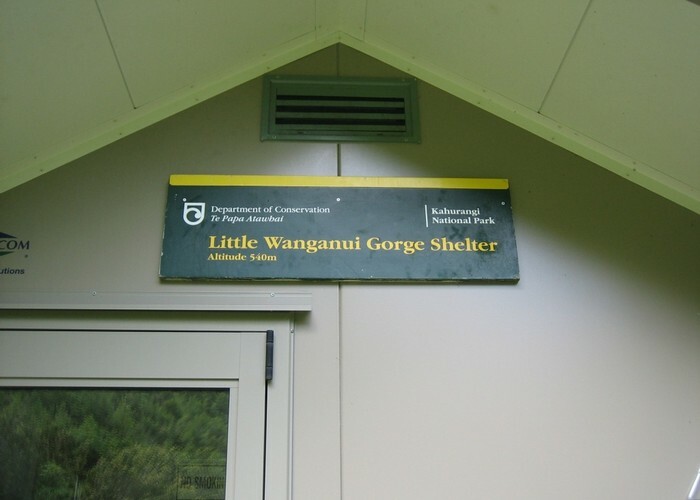 Little Wanganui Gorge Shelter name • By iangeorge. Licence: C.
Back at the north side of the flat, the track turns northward into the forest and climbs unflinchingly up the side of the glacial valley. Riflemen will egg you on and big old trees, hanging with epiphytes, stand by, unmoved. A band of neinei marks the edge of the forest almost right on the saddle. The view to the northwest extends along the Little Wanganui valley, over low hills and on to the Tasman Sea. Alpine herbs are matted on the ground and rounded outcrops of granite poke through handsomely. The saddle neatly delineates the border between two climatic regions, and two divergent standards of track maintenance. From here on it's the West Coast. The walking is harder. The track is rougher, overgrown, poorly marked and endlessly detoured around slips, gorges, and private land. But the forest is rich, wild and beautiful. It is, nevertheless, a long way down to the hut. A poled route leads down pasts a couple of tarns through sub-alpine shrubs, where grasshoppers sunbathe on the track, and birdsong drifts from the nearby pockets of beech. The track drops into mossy forest on a sunny path of rocks and roots. It soon crosses a stream beneath the tarns and becomes a pretty shingled path through shrubbery, then pushing into forest. Dense and diverse, the forest includes but is not limited to Astelia, neinei, mountain cabbage tree, tree fern, fuchsia, broadleaf, silver beech, veronica, horopito, Gaultheria, orihou, pate, ribbonwood, lawyer, wineberry, coprosma, marbleleaf. Struggling through grassy undergrowth, the track is benched erratically. After entering a higher, more homogeneous forest and passing under massive buttressed red beeches, the track jumps a fast creek and crosses the almost flat, open scrub of an old slip. Wangapeka bivA bivouac is located just before a bridge over the Little Wanganui near 2 hours from the saddle. Cross to the true right bank, back into a cool, young forest of beech, kamahi and pate. Beyond here the track alternates between smooth travel in forest and rougher open bouldery travel. Rata, Gaultheria and veronica occupy the open sections. Where Piano Creek enters opposite, a sign marks the route to the Johnson River by fording the Little Wanganui and crossing Kiwi Saddle. Tangent Creek, the biggest tributary, is nearby, a wide, sunny river with a knee-deep ford and a handwire. Stone Hut • By pmcke. Licence: C.
Just beyond Tangent Creek the track splits at an unclear junction. The high water track becomes a rocky hand-over-hand climb, levelling off as a high tangled sidle. This track drops into the granite chute of McHarrie Creek, where there is a handwire, and climbs again. It soon descends slowly and with difficulty, then quickly to the bouldery Smith Creek almost 1 hr and less than 1km later. The low water route is along the river-bed. The two tracks rejoin at Smith Creek, where the junction is clearly marked. The hut is just 30 minutes away along a flat wide track next to a deep blue gorge. 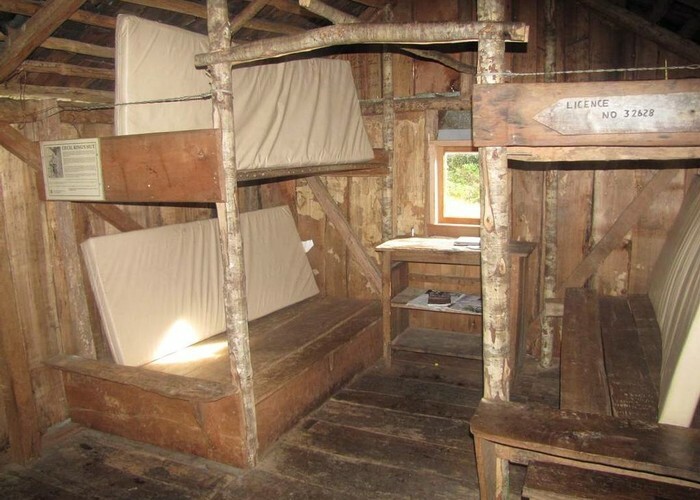 Bell Town / Manunui hut • Serviced Hut (DOC). Capacity: 10. The track sets off easily, passing the signposted route to the Kakapo River and a small ford after a few minutes. A small swingbridge crosses Lawrence Stream and the track becomes a rougher benched sidle above the river, briefly boardwalked around a rock face. Grassy river-flats with lawyer, tree fern, bracken and marbleleaf lead to the spacious Gilmore Clearing. The old Wangapeka Road begins here. The wide road leads away from the river through low, regenerating forest, punctuated by occasional standing podocarps and eucalypts. The road is pleasant, relaxing walking, occasionally crossing ancient wooden vehicle bridges over slow brown creeks. Further on, the track bends well away from the river to avoid private land, before eventually coming to the road end shelter. Inside Cecil Kings Hut • By pmcke. Licence: C.
The Wangapeka is very well served with side tracks, making all manner of options and variations possible. Gibbs Route leads onto the Arthur Range 30 minutes from the eastern track end. On the range, head to John Reid Hut and down Chummies Track, or along to Mount Patriarch and down to Kiwi Saddle. Kiwi Track leads up to Kiwi Saddle Hut (3 hours). From here, head up Mount Patriarch, down Taylor Stream, or up onto Mount Luna. Mount Luna Route leads up Stone Creek from Stone Hut. 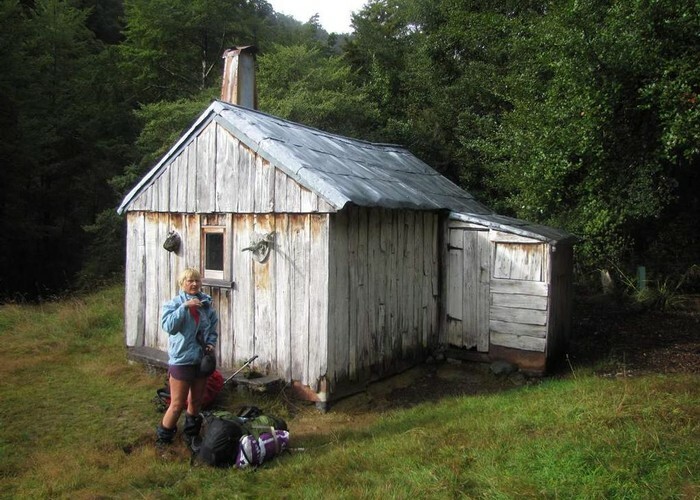 Make a tops trip over to Kiwi Saddle Hut. Matiri Tops Route heads up from Wangapeka Saddle onto the Matiri Range. Follow it through to Hurricane Hut. 1 hour from Wangapeka Saddle to the bushline. Biggs Tops Route leads from Wangapeka Saddle up onto the Biggs Tops then down to Trevor Carter Hut. 1 hour from Wangapeka Saddle to the bushline. Lost Valley Track leads from Helicopter Flat Hut through to Trevor Carter Hut. 2 hours. From here, head up the Karamea River on the Leslie - Karamea Track, or down past Saxon Falls to rejoin the Wangapeka Track. A track leads up Herbert Creek and over Kakapo Saddle to the Kakapo River. Beyond Little Wanganui Saddle, Johnson Track leads up Kiwi Creek and the Johnson River. Added 1 June 2001 by MatthewMatthew. 3 revisions, most recently 14 December 2015 by MatthewMatthew. 533 views in the past year (44 per month).